Wenatchee, WA (October 28, 2016) – From her start in go-karts then migrating to Mini Stocks and other forms of circle track racing, Brittney Zamora has found success in each division. In her first year of Northwest Super Late Model Series competition the 17-year old focused on continued racing success culminating with an effort to capture the Jefferson Pitts Racing Rookie of the Year title. Closing out the season with strong runs at the Yakima Speedway Fall Classic and Neal Newberry 125 at Wenatchee Valley’s Super Oval, Zamora amassed the points needed to reach her goal. The second-generation Kennewick, WA driver admits it was a team effort to capture this year’s JPR Rookie of the Year title. 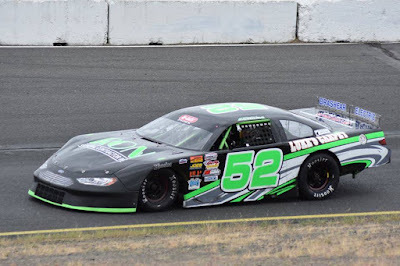 In addition to earning the Rookie of the Year award, Zamora claimed fourth place in the NWSLMS Championship standings, just two points out of third. Being a rookie in a super late model series was tough, but a learning experience for Zamora. By winning the Jefferson Pitts Racing Rookie of the Year, Zamora will get the opportunity to test at Yakima Speedway with Jefferson Pitts Racing NASCAR K&N West team. Over the last two seasons the JPR K&N organization has become one of the top programs in the country with wins in both the NASCAR K&N West and East Series. One of JPR’s drivers, Noah Gragson, just signed to compete full time on the Camping World Truck Series with Kyle Busch Motorsports. Zamora will be looking to make the most of the test session with JPR. Heading into the offseason after a successful rookie campaign, Zamora and her team aren’t slowing down anytime soon. Zamora won the JPR Rookie of the Year award over Spokane, WA driver Dirk Bennett. The award was given by scoring the driver’s best seven races out of an eight-race season. Zamora claimed 261 points while Bennett earned 211 points. Bennett finished ninth in the 2016 NWSLMS championship standings. Zamora will receive her Jefferson Pitts Racing Rookie of the Year award in January at the NWSLMS Banquet. The award will be one of many given out by series at its January banquet, as over $25,000 in cash and awards will be presented to eligible drivers and teams. The Northwest Super Late Model Series Inc. is the premier regional touring Super Late Model series in the Pacific Northwest. The series has many valued sponsors including Hoosier Racing Tire, McGunegill Engine Performance, Port City Race Cars, AR Bodies, Joes Racing Products, Accelerated Graphics, Five Star Bodies, Longacre Racing Products, Wheel Chill, KRC Power Steering, Racers Against Child Abuse, Atomic Screenprinting and Embroidery, Franks Racing Radio, BLP, Jefferson Pitts Racing and Racing Dynamics. For more information on the series visit www.nwslmseries.com or on Facebook or Twitter. SACRAMENTO, CALIFORNIA (October 27, 2016) – Glenn Hutchison's #8 Orchex / Royal Purple / All Valley Towing Rex Hutchison Beast won the 2016 King of the Wing Western Sprint Car Series owners championship. Idaho's Bryan Warf scored a pair of top-two finishes over the season finale weekend at Tucson Raceway Park earlier this month to seal the deal. Warf's runs were also enough to propel him to second in the Western drivers points as well. 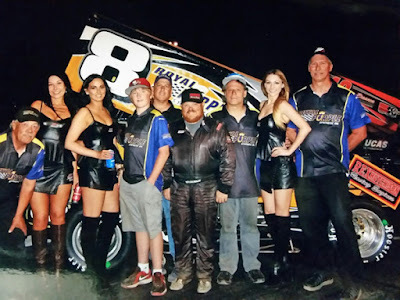 Hutchison's team utilized the services of his son Dylan for the Madera opener in March with a third place finish after an early race spin, then called on Warf after Dylan suffered an off-track injury unrelated to racing. Warf's relationship to Hutchison came through Warf driving Pat Russell's #91 Sprint Cars in the Northwest powered by Rex Hutchison Racing Engines. Warf immediately stormed to victory at Rocky Mountain Raceway in Utah on Memorial Day along with Madera Speedway on June 11th and Stockton 99 Speedway in August, with Saturday's Tucson victory becoming his fourth of the year. His two fast times over the weekend at Tucson lowered his season long qualifying average in the Hutchison #8 to 2.66 where he qualified no worse than sixth all year. He also finished in the top three in every heat race he ran this year with two heat race wins. Tennessee's Kyle Edwards ran the Orchex #8 in the co-sanctioned Royal Purple King of the Wing National races over October 8-9 with seventh and sixth place finishes, while Warf went back to Pat Russell's #91. Warf returned to the Hutchison #8 for the Tucson weekend with a 20 deficit to second in points Tom Baker while Hutchison's team already occupied the owners points lead. Friday's 13.040 second lap in time trials at over 100 miles per hour average gave Warf a new track record. He followed that up with a third place finish in his heat race. He rolled off sixth for the 30 lap feature but marched into third by the conclusion of the opening lap. He used the inside line to get around Utah's Ryan Burdett for second and chased Davey Hamilton, Jr. through lapped traffic and a series of restarts to ultimately finish second. Saturday's activities got underway with Warf again in the 13.0s for fast time and lowering the track record again but this time parlaying that into a heat race win. He continued his sweep of the evening by winning the 30 lap feature. Doing nearly all he could do, Warf propelled the #8 team to the Owners championship by 24 points but missing out on the drivers title by just one point. The result was remarkable for Warf as he missed the season opener at Madera as part of the seven race super series. The owners championship was made possible by the power from Rex Hutchison Racing Engines, with Rex passing away not long after the championship weekend. The team dedicates its championship to Rex's memory. You can learn more about Dylan Hutchison Racing at www.dylanhutchison.com or by visiting the team on Facebook at keywords “Dylan Hutchison Racing”. Dylan Hutchison Racing is presented by Orchex, LearnPort, Royal Purple, Rex Hutchison Racing Engines, Naake Suspension, All Valley Tow, Rich Howell Racing, Race Tec Pistons, DG Headers, Harris Industrial Gases, WrapStar Pro and Blakesley Sports Media. HAVASU 95 SPEEDWAY. 1/4 MILE. LAKE HAVASU CITY, AZ. 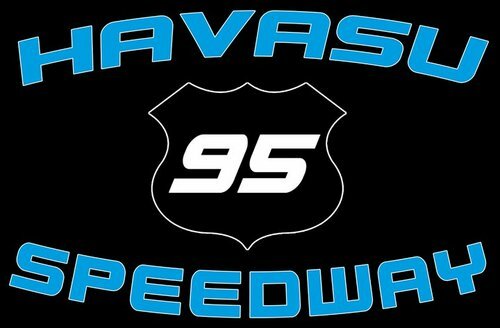 www.havasu95speedway.com OCTOBER 29TH. On any given Saturday race night, the Havasu 95 has always proven that they are capable of putting quality shows that pleases their fans. They're going to do it again this Saturday night with a very hot ticket led by champion's night for the famed Lucas Oil Modified Racing Series, presented by Loan Mart. The Hoosier Tire 100, presented by D J Safety, is 100 green flag laps of excitement, within a 25 car field, that pays that win. However, the grand prize is the season championship which pays $5,000 plus $1,000 in Lucas Oil Products. Matthew Hicks, Scott Winters and Taylor Miinch are going to be the drivers to watch as this title run unfolds. Also on the race agenda will be the speedway's fan favorite divisions: the Get It In Gear Street Stocks, the Havasu Wiring Outlaw Karts and the always fun Sam Nichols Electric Factory Stocks. Saturday is a day race. The spectator gates will open at 12 pm with the green flag falling on the first race at 2pm. All of this racing action is being sponsored by the Mudshark Brewery. General admission tickets, age 17 plus, are $12. Tickets for seniors, military personnel and the handicapped are $10, Kid's tickets, age six to 16, are $6 while kids age five and under will be admitted free. The speedway offers a budget friendly family pack, priced at $25, which admits two adults and two kids. Fans can also enjoy the special amenities of the speedway's VIP section for $25. IRWINDALE EVENT CENTER. 1/2 - 1/3 MILE OVALS & 1/8 MILE DRAG STRIP. IRWINDALE, CA. www.irwindalespeedway.com THURSDAY, OCTOBER 27TH & SATURDAY, OCTOBER 29TH. Once again the IEC will convert an oval track into a one-eighth drag strip to present their highly popular NHRA Thursday Night Thunder program while, at the same time, sending their powerful message that says "RACE THE STRIP & NOT THE STREET." This program is open to all types of vehicles from professional race cars to the vehicle parked in your driveway. The program is also very budget friendly. A $20 entry fee will allow you to race all night, a $10 spectator fee will let you watch them race. The spectator gates will open at 4pm followed by racing from 5 to 10pm. On Saturday night the IEC will present another round of their Night Of Destruction, presented by Pick Your Part and Seidner's Collision Centers. This is a program that this speedway excels in and is well worth the price of admission. Featured events include: a flag pole enduro race, skid plate racing, a figure 8 enduro race, a powder pull compact car demolition derby, trailer racing and a jet truck exhibition. Also, for you roundy round racing, the Irwindale Truck Series will be racing for double points. The gates will open at 4pm followed an on track meet and greet autograph session. The destruction begins at 7pm. General admission tickets, age 13 plus, are $10 if purchased in advance. Otherwise the tickets will be $15 on Saturday race day. Child tickets, age six to 12, are $5. Advance tickets can be arranged via through the speedway's website or by visiting their box office. There is also a $5, cash only, parking fee on race day. KERN COUNTY RACEWAY PARK. 1/2, 1/4 & 1/8 MILE OVALS. BAKERSFIELD, CA. www.kerncountyraceway.com SATURDAY, OCTOBER 29TH. Here's another red hot racing ticket from KCRWP who will be treating their fans to the Fall Shootout this Saturday night presented by Bullwark FR. Highlighting the evening will be the Spears SRL Southwest Tour, one of the most prominent regional touring series racing in the western area. The teams will be running in the Bulwark FR 150, presented by 51 Fifty Energy Drink. The race will be ran in twin 75 lap segments with a $1,000 bonus, from His Work Gift Baskets, at the conclusion of the first segment. The Fall Shootout also includes high energy racing from the speedway's NASCAR Super Stocks, the NASCAR Mini Stocks, the INEX Legends and the Race Car Factory Spec Late Models. The spectator gates will open at 4pm following by qualifying. The main events will go green around 7pm. General admission tickets, age 16 plus, start at $15. Tickets for kids, age six to 15, active duty military and seniors age 65 plus are $10. Kids age five and under will be admitted free. Advance tickets are available through the raceway park's website. LAS VEGAS MOTOR SPEEDWAY. 1/4 MILE DRAG STRIP. LAS VEGAS, NV. www.lvms.com THURSDAY, OCTOBER 27TH THROUGH SUNDAY, OCTOBER 30TH. Those powerful cars and motorcycles from the NHRA Mello Yello Drag Series returns to Las Vegas for this weekend's Toyota Nationals. The fun begins on Thursday with the NHRA Fan Fest to be held on Fremont Street on the Third Street Stage. The event begins at 5pm with live music an give aways followed by a one hour autograph session featuring 30 of the NHRA's most prominent drivers. The event concludes with a special NHRA light show. Then it's time for NHRA racing action on Thursday, Friday, Saturday and Sunday with the spectator gates opening at 730am on all four days. Thursday's schedule begins with qualifying rounds at 8am. Friday's qualifying rounds begins at 11am. Saturday qualifying, plus two elimination rounds, starts at 10am. There will also be a jet dragster exhibition, at 550pm on both Friday and Saturday. Sunday is of course the day when everything is on the line. Elimination rounds will begin at 9am. Needless to say, an event of this stature is going to have a large variety of ticket options that runs the gamut from budget friendly general admission to top of the line VIP packages. Ticket options can be found on LVMS website or by calling 1 800 644 4444. MERIDIAN SPEEDWAY. 1/4 MILE. MERIDIAN, ID. www.meridianspeedway.com SATURDAY, OCTOBER 29TH. It's Trunk Or Treat time at Meridian this Saturday night. The feature of the evening will be the annual Halloween Enduro 250, for Hornet division cars, presented by PBT Auto, 2C Auto and Kim's Kars. On the line here is a $650 winner's check along with the crowning of a Tate's Rents Hornet division champion. Kids in Halloween costumes are invited to Trunk Or Treat in the pits for free from 1230 to 230pm. Drivers will be providing the candy. The spectator gates will open at 10am with the 250 lap enduro race going green at 330pm. Ticket prices are very fan friendly for this event. Tickets for adults, seniors, military personnel and kids, age seven plus, are only $6.50. Kids age six and under will be admitted free. TUCSON SPEEDWAY. 3/8 MILE. TUCSON, AZ. www.tucsonspeedway.com SATURDAY, OCTOBER 29TH. Following an ultra successful 2016 season, it's Grand Finale time at Tucson Speedway. Saturday night will be highlighted by the Super Late Models who will be running a 100 lap, double points, main event before crowning a champion. Also, championship resolutions will be decided in the speedway's Modified, Pro Stock and Bomber divisions as well. For the kids the speedway will be hosting trunk or treating. The spectator gates will open at 5pm followed by racing at 7pm. General admission adult tickets are $12 and $10 for seniors and military personnel. Tickets for juniors, age 11 to 16, are $7. Kids age ten and under will be admitted free when accompanied by a paid adult. The speedway also offers a budget friendly family pack, priced at $30, which admits two adults and two juniors. Bakersfield, CA – The SPEARS Southwest Tour Series will make its second and final appearance of 2016 at Kern County Raceway this Saturday night for the “Bulwark FR 150 presented by 51 FIFTY Energy Drink”. Saturday night’s 150-lap event at the high-banked half-mile is the penultimate race of the 2016 SPEARS Southwest Tour Series championship season. CHAMPIONSHIP TOP TEN: Current top ten in the SPEARS (SRL) Southwest Tour Series championship standings: Derek Thorn-Bakersfield, CA 1178 points, Ryan Cansdale-Laguna Beach, CA 1129, Christian McGhee-Claremont, CA 1106, Jacob Gomes-Manteca, CA 1057, Bobby Hodges-Carson City, NV 1037, Blaine Rocha-Oakdale, CA 984, Carlos Vieira-Livingston, CA 970, Keith Spangler-Porter Ranch, CA 947, Brandon White-Eureka, CA 796, Andre Prescott-La Quinta, CA 675. WINNER’S PRIZE: The winner of Saturday night’s “Bulwark FR 150 presented by 51 FIFTY Energy Drink” will be awarded the $5,000 winner’s purse, plus the maximum 180 championship points. RACE FORMAT: Saturday night’s race for the SPEARS Southwest Tour Series will be 150 laps with a halfway break at lap 75. During the 8-minute break, teams will be allowed to fuel the cars and make chassis adjustments. HALFWAY BONUS: The leader of the race at lap 75 will receive a $1,000 bonus from ‘His Works Gift Basket Co.’. RECORD FIELD OF DRIVERS: The previous record for the number of drivers entered in a SPEARS Southwest Tour Series points paying event at Kern County Raceway was 24, this weekend’s race has a record 30 entries. FOUR LOCAL TRACK CHAMPIONS: There are three former and one current Kern County Raceway championship drivers entered in Saturday night’s SPEARS Southwest Tour Series “Bulwark FR 150 presented by 51 FIFTY Energy Drink”; David Mayhew, Brian Richardson, Johnny White and the 2016 NASCAR Late Model champion, Buddy Shepherd. ROOKIE CHALLENGE: NTS Motorsports driver, Christian McGhee, holds the lead in the 2016 Rookie-of-the-Year Challenge standings, ahead of Andre Prescott and Trevor Huddleston. WINTER SHOWDOWN TUNE UP: With Saturday being the final race of the year at Kern County Raceway, many teams will use this weekend as a final tune up for the February 11th “Winter Showdown”. The “Winter Showdown” is the “Richest Short Track Race in America,” paying $30,000 to the winner. FIRST CAREER STARTS: Two drivers will make their first career SPEARS Southwest Tour Series start this Saturday night; Doni Wanat from Woodenville, Washington and Eric Norris from Dana Point, California. Wanat is a 2016 Northwest Super Late Model Series event winner, and Norris, who is the son of actor Chuck Norris, is a former NASCAR K&N Pro Series champion. TRICK or TREAT and FIREWORKS: In the spirit of Halloween, kids 10 and under in costume will be admitted free to the race. Kids can ‘Trick or Treat’ during the on-track autograph session and there will be a Fireworks Spooktagular just before the engines fire for the SPEARS Southwest Tour Series “Bulwark FR 150 presented by 51 FIFTY Energy Drink”. EVENT 411: Spectator gates open at 4pm, SPEARS Southwest Tour Series qualifying at 5pm, ‘Trick or Treat’ Autograph Session at 6pm, racing begins at 7pm. FINALE: The final race of the 2016 SPEARS Southwest Tour Series championship will be the $10,000 to win ‘Championship Season Finale’ at The Bullring at Las Vegas Motor Speedway on November 19th. For more information go to www.SRLSouthwestTour.com or www.KernRaceway.com. There has been a standing tradition that says the Lucas Oil Modified Racing Series, presented by Loan Mart, starts and finishes its racing season at the Havasu 95 Speedway, the quarter mile paved oval located in Lake Havasu City, Arizona. That tradition will be observed this Saturday night when the modifieds roars under the green flag during its annual champions night. 2016 has been another banner year for this very popular series. The racing has been exciting all year long featuring extremely healthy car counts that displayed a blend of racing veterans and young drivers competing in a wheel to wheel environment that often had their fans standing up for the entire event. Fans can expect more of the same high quality when the green flag falls on Saturday night's Hoosier Tire 100, presented by DJ Safety. The final Lucas Oil Modified race of the season is 100 laps, with a starting field of 25 cars, that pays $2,000 to win. However, the grand prize will be awarded at the end of this race when a new 2016 champion is crowned. That grand prize will award this champion a check for $5,000 plus $1,000 in Lucas Oil products. Going into Saturday night's race there are three main principals vying for the series' 2016 championship. Matthew Hicks goes into Saturday night on top of the championship standings with 589 points. He holds a 16 point advantage over series veteran Scott Winters and a 19 point lead over Taylor Miinch. All three drivers have been strong this year and all three are worthy of the series' 2016 championship. However, they will also have to deal with some equally strong cars piloted by drivers who will be looking to collect that aforementioned $2,000 winner's check Saturday night. Put all of these elements together and you've got the makings of major league racing excitement. If by chance you can't make it to the Havasu 95 Speedway Saturday night, the next best thing to being there is Lucas Oil Racing TV who will be presenting the Hoosier Tire 100 via their live computer stream. The race coverage will go live beginning at 5pm eastern time. The quality of these broadcasts are outstanding and extremely affordable You can receive all of the necessary details at www.lucasoilracing.tv . The champions night will begin on Friday evening with a test and tune session for the teams from 6 to 9 pm. The grandstands will be open to fans free of charge. On Saturday race day the green flag will fall on the first event at 2pm. Adding to the Saturday excitement will be the Havasu 95 Speedway's fan pleasing local racing divisions highlighted by the Get It In Gear Street Stocks, the Havasu Wiring Outlaw Karts and the Sam Nichols Electric Factory Stocks. General admission tickets, age 17 plus, are $12. Tickets for Seniors, military personnel and the handicapped are $10. Tickets for kids, age six to 16, are $6 with kids age five and under admitted free. The speedway also offers a family pack, priced at $25, which admits two adults and two kids Fans can also enjoy the amenities of the VIP section, featuring the best seats in the house, for $25. Tuesday - Oct 25th - 3 pm eastern - 12 pm pacific. Tell your family, friends and especially your sponsors that your Lucas Oil Modified Racing team is going to be featured on national television.